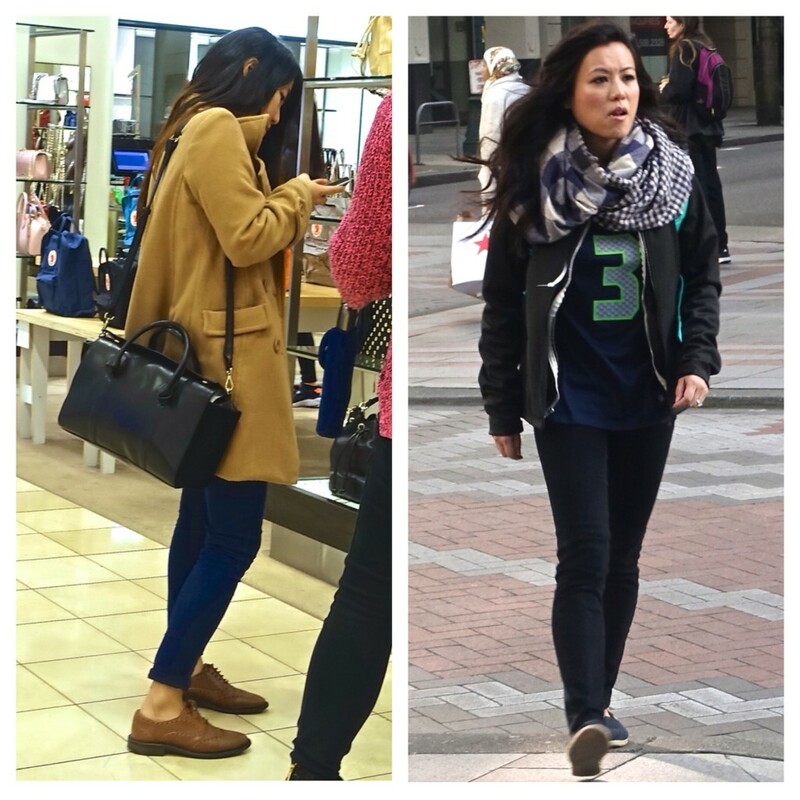 On a couple of recent trips to Seattle, I’ve noticed the city has style. It’s own style, or perhaps I should say, styles. 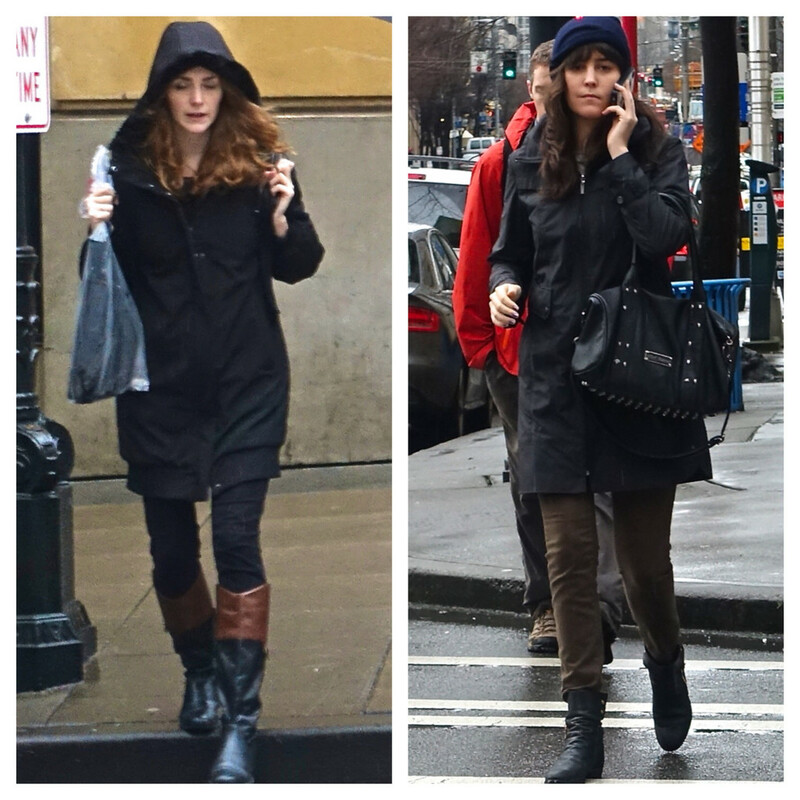 While I admit I didn’t take to some of it instantly, the more I see, the more I get (and appreciate) Seattle street style. 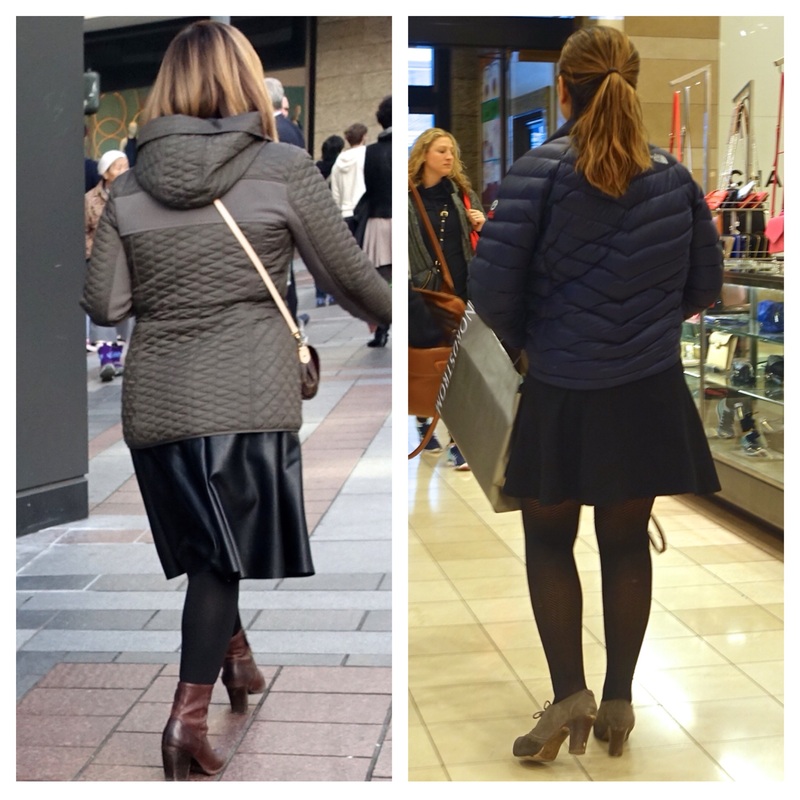 A very popular look downtown on a winter weekday afternoon is the athletic jacket over everyday dress. 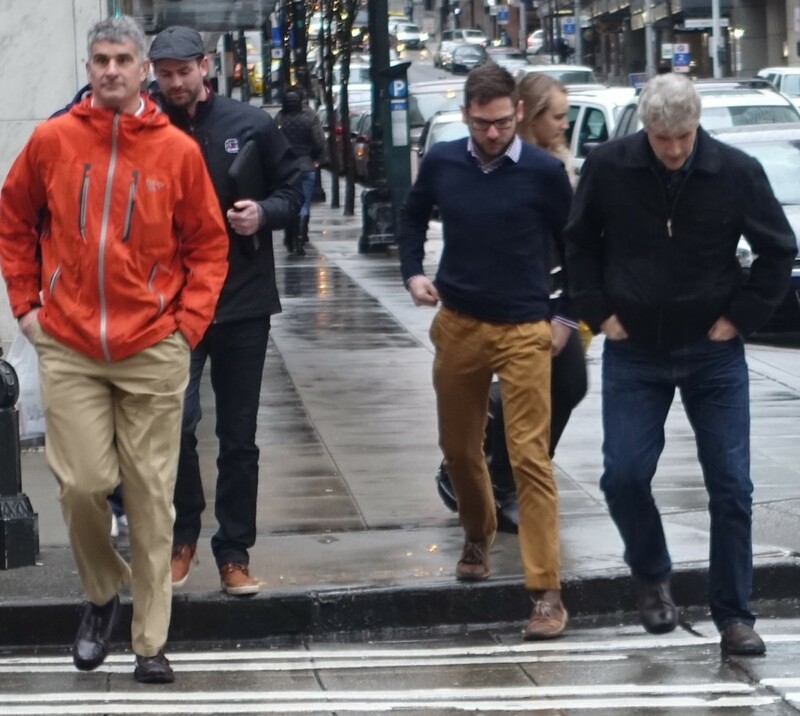 Despite the percentage of overcast and rainy days, loads of people in Seattle are physically active; so, it is no wonder that North Face and other athletic wear are ubiquitous among people working out or just hanging out. 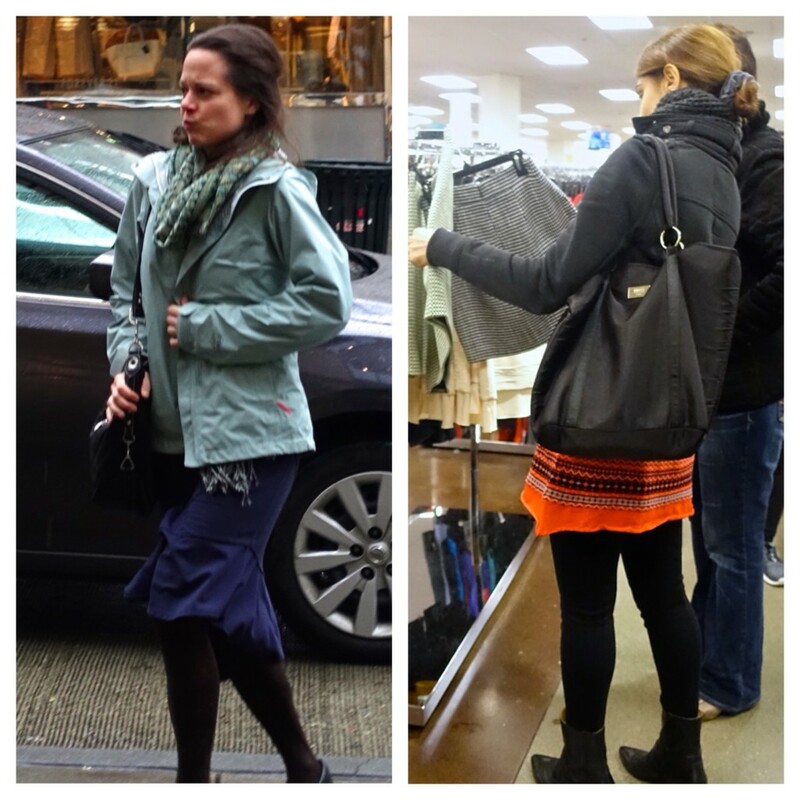 I have to say that upon first seeing the pairing of a skirt with a quilted rain jacket, it can be a bit jarring for the unfamiliar – at least it was for me. I had a similar impression while glimpsing skirts worn with rain slickers and fleece jackets. 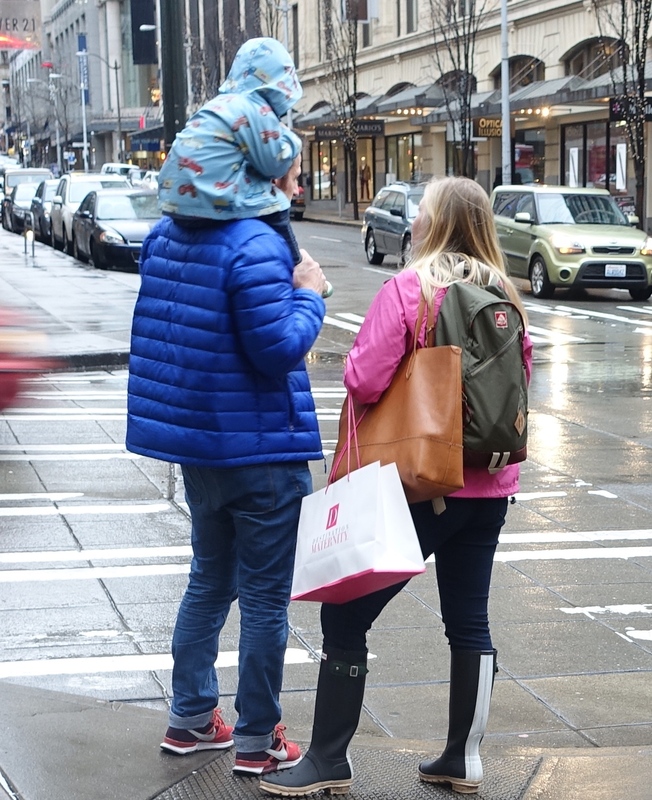 I’ve developed a hypothesis: maybe people in Seattle might think of the rain jacket as a wearable umbrella; in terms of aesthetics, it doesn’t really “count” as part of the outfit. Immediately thereafter, I was passed by some dudes looking pretty cool in sporty jackets with chinos, and stylishly casual shoes. 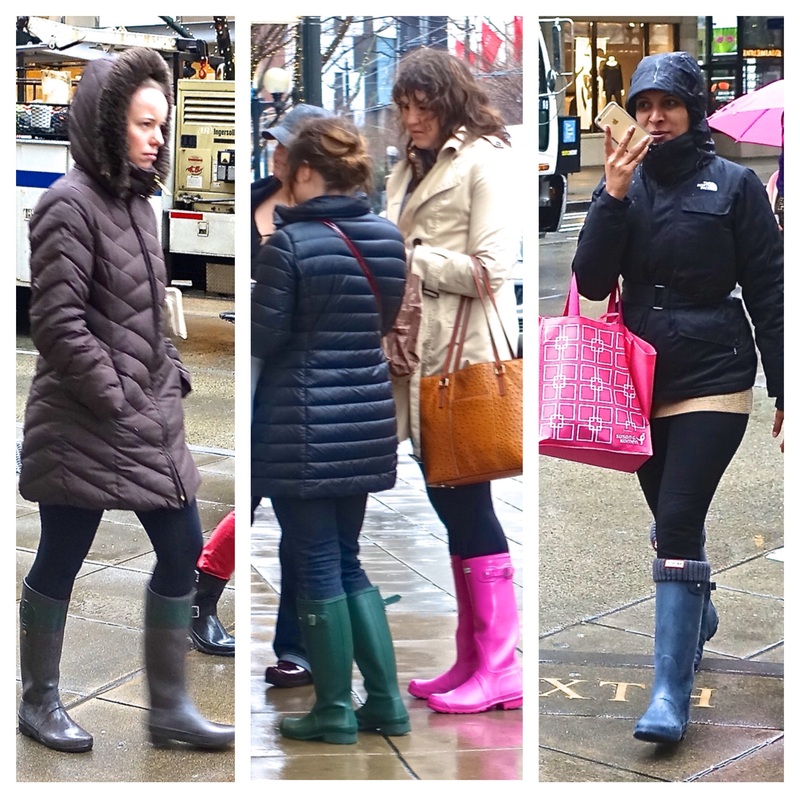 Another popular item in Seattle street style are rubber galoshes. The more brightly-colored ones were more to my liking. 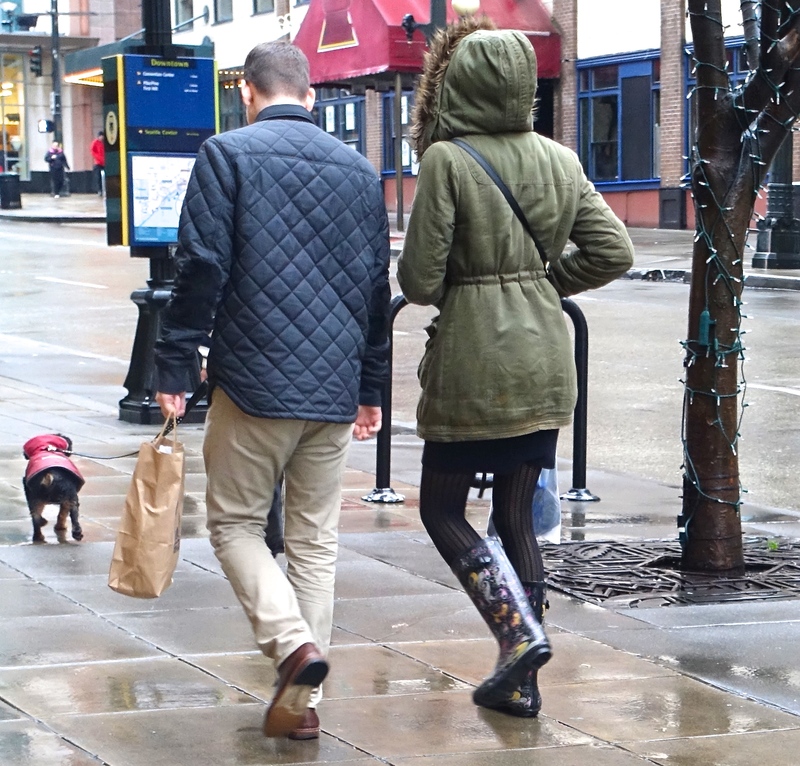 Galoshes make sense. Birkenstocks? 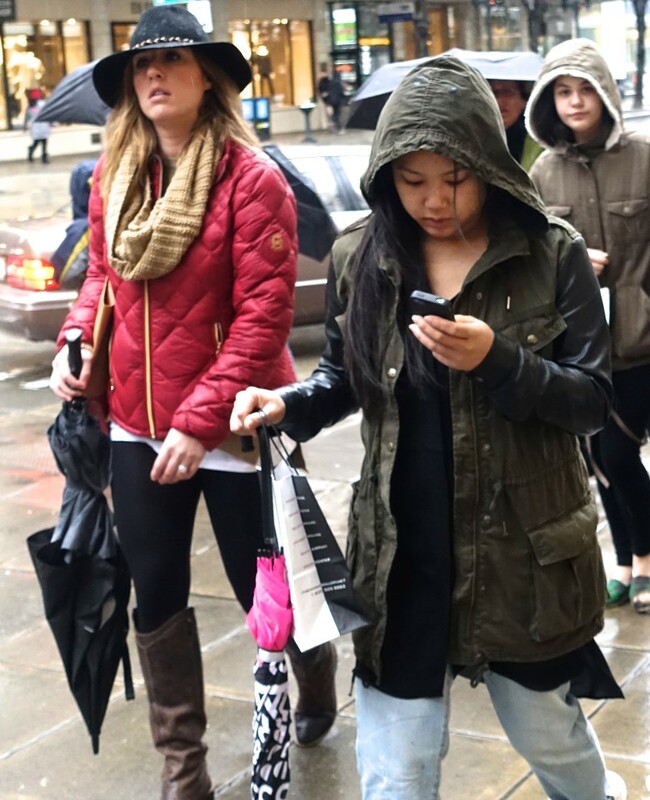 I can only imagine they are this Seattle resident’s brazen unaffected-by-the-rain look, like the aversion of some to carrying an umbrella. 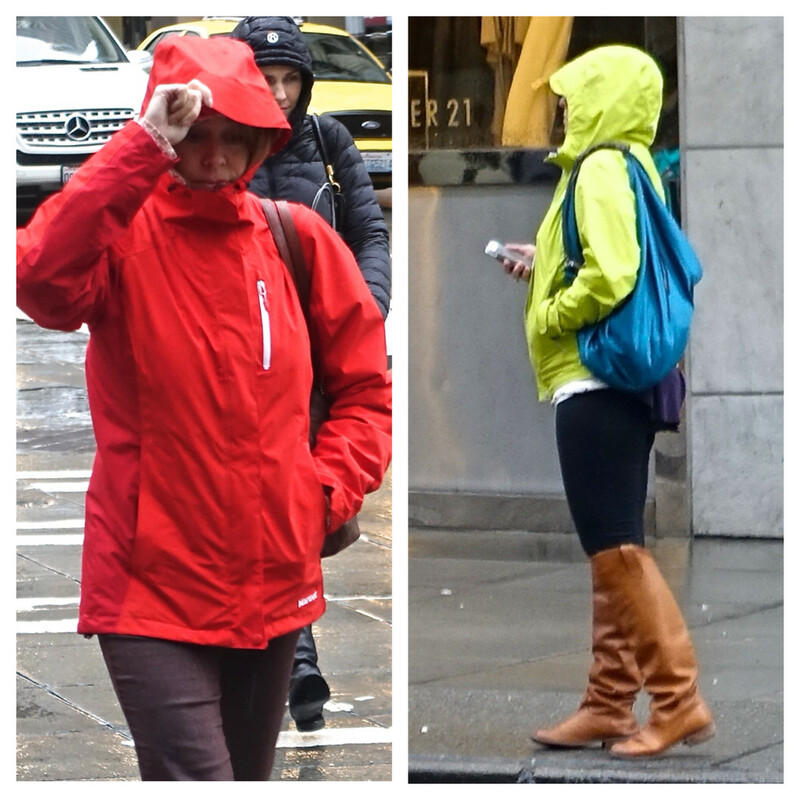 While observing Seattle street style, I couldn’t help but notice what seems to be a penchant for donning active wear in vibrant colors. I must say that under a muted sky, the color show on the street certainly brightened my day. Of course, bright colors need not be restricted to active wear. 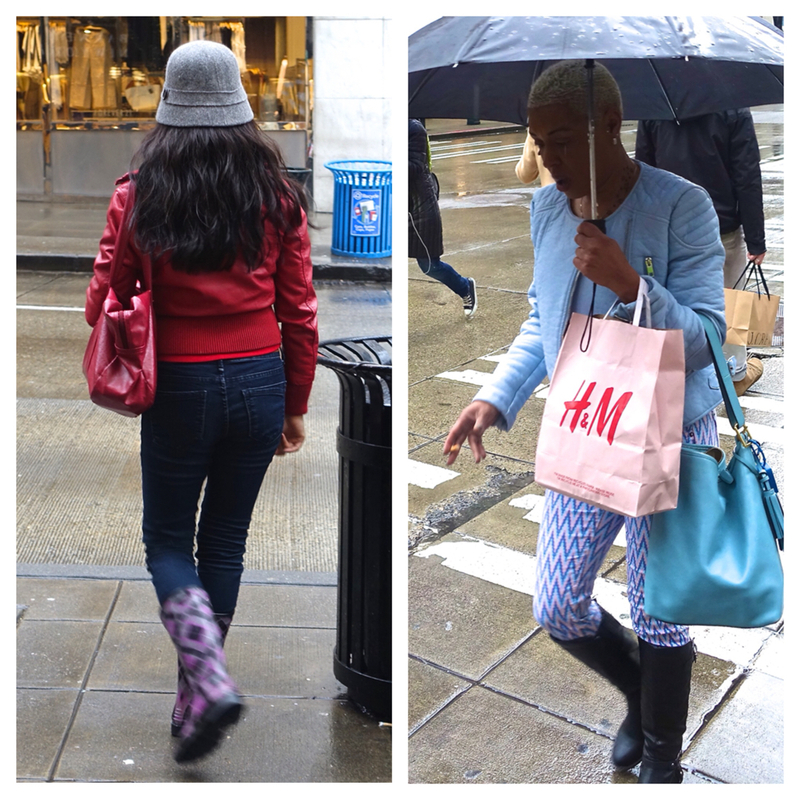 Patterned leggings are another way of displaying color…or liveliness. Then there are of course, more conservative looks. 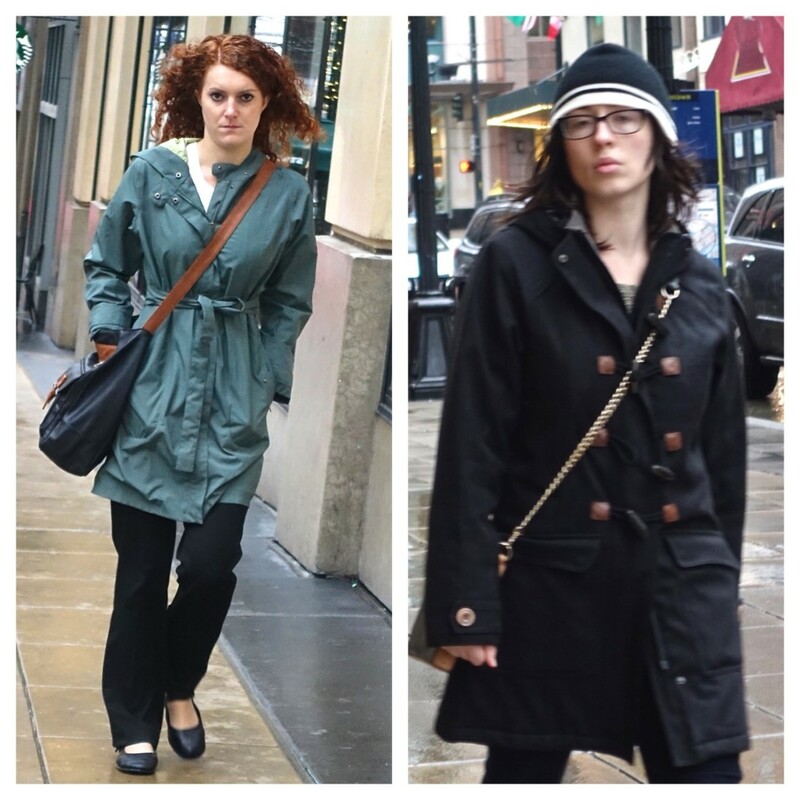 These include dressier and trench style coats/jackets: a very classy look on some people who although they were not wearing the aforementioned athletic wear or sporty jackets, looked to still be pretty physically active. 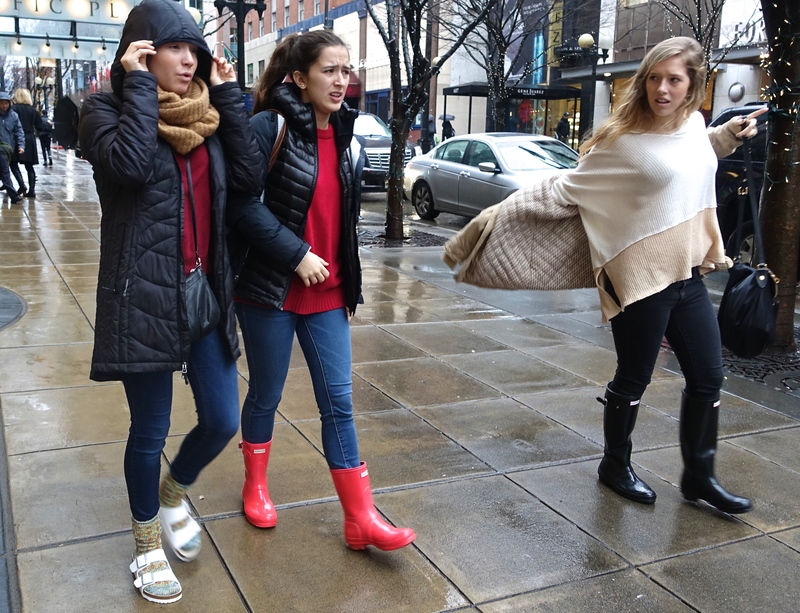 I was struck by the ensembles of people who seemingly have the attitude, “I am not at all bothered by rain.” Sweaters?! The sweater on the left is at least hooded! Another look which I find compelling seems to be a carry-over of grunge, complete with zipper hoody or plaid flannel shirt. 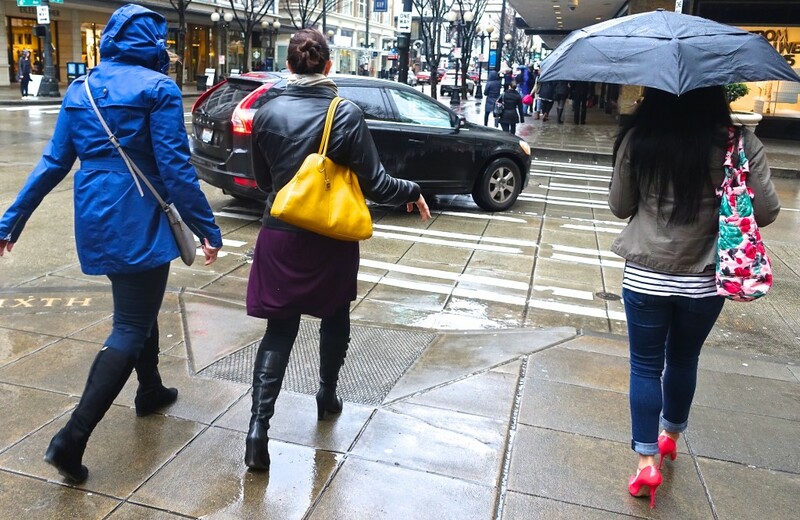 Plenty of Seattle street style seems to be gender-neutral – and adorable! 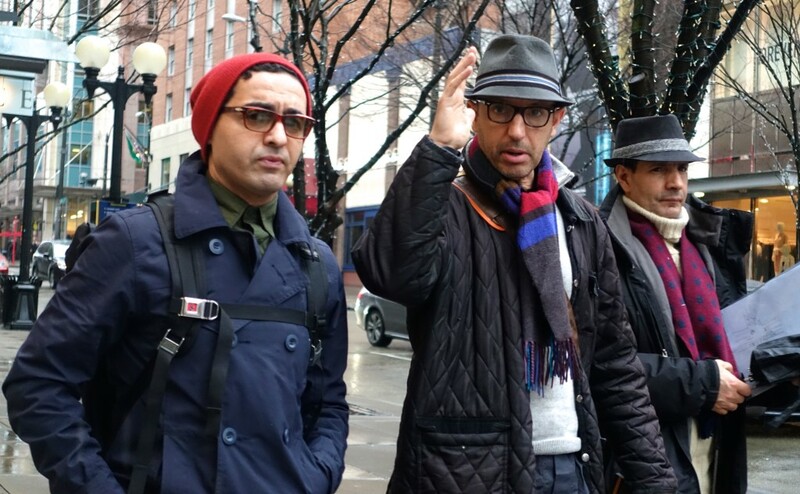 The city, with a median age of 37, is teaming with smart, active, hip, upwardly mobile (think Microsoft and Amazon), technology savvy aesthetic experimenters. At least, that’s my point of view. Pretty cool! 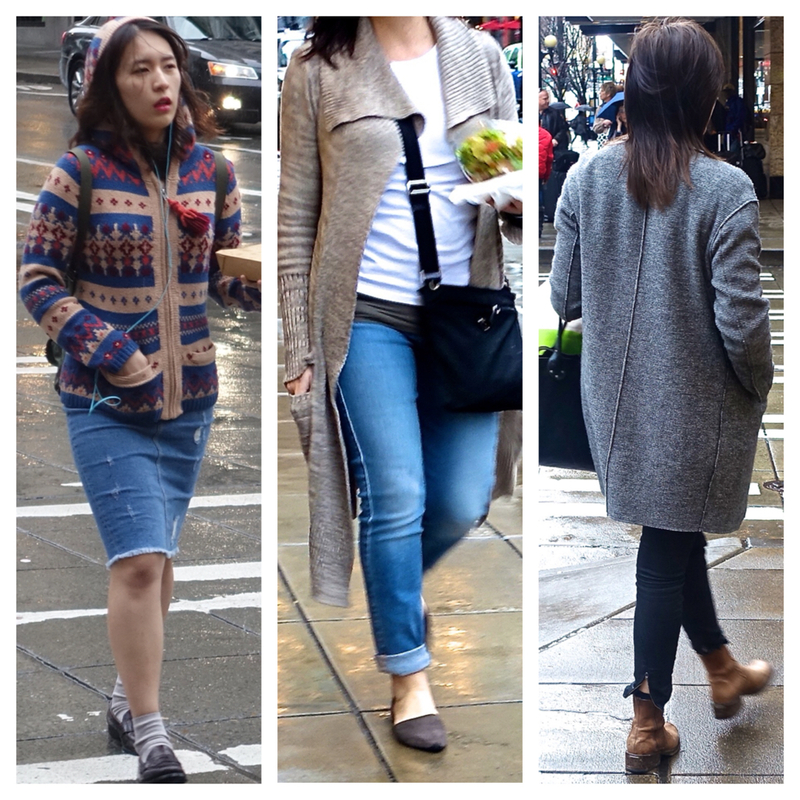 How do you see Seattle street style? Earlier, I have never seen the posts, though it is very interesting. thanks a lot!